I've got a crush on ruffles. It's been growing for awhile, and only intensified after reading this post over at SYtH. Isn't this shirt so indredible? I will have dreams about it. What do you all think? Anyone else feeling the ruffle love? Leave a comment. totally feeling it! you are not alone in your love for ruffles. i'll be sad when fashion decides that they are so last year. I love ruffles. I have decided that they are a requirement for any new clothes I buy. 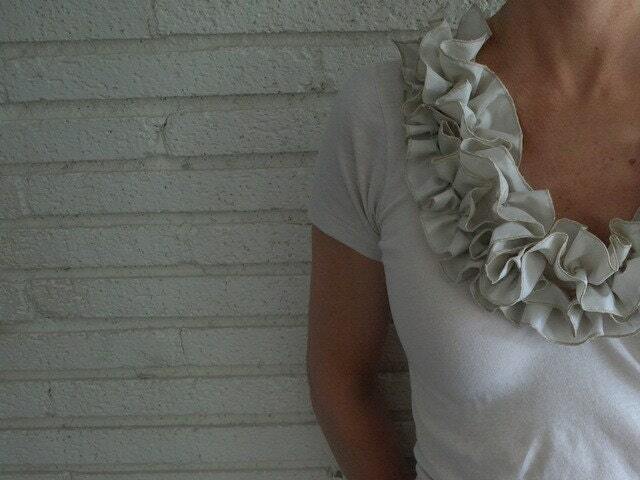 i don't usually like ruffles, but i love the way they're done on that shirt. Currently looking for the perfect ruffle shirt in fall's soft palette (a champagne pink??) to wear under a new gray cardigan. Also thinking I need some short black boots. Need being sort of relative. Want 2 no my secret for cheap fashions? Go to the dollar store and buy some of the white t-shirts they sell in a pack and staple some tissue paper up in flower formations. BAM! That's a look they try to steal on Project Runway but it's a Rondell Jenkins patented original. had i not seen the shirt first...i'd have said, "Um, ruffles...no thank you. Unless their on my chips!" but that shirt is GORGEOUS! The seller is in the process of moving to France so you cannot see it in her store but I am just waiting for her store to open so I can order one. amydear- there is a very pretty pink (not sure if the color is subtle enough for what you are looking for) sleeveless ruffled top at Ruche. ROSA! That top is incredible. Love love love! I LOVE ruffles! That shirt is gorgeous!! On an unrelated note... found a great alternative for the JCrew mini cord skirt ($50). Target's Merona brand has cord skirts for $20. Three colors - merlot, gray, and khaki.